Ivory 132×88 Banquet Tablecloths, Polyester Blend Total Stock: 15 *Floor length on a 6′ Banquet Table. Ivory 156×88 Banquet Tablecloths, Polyester Blend Total Stock: 24 *Floor length on a 8′ Banquet Table. Ivory 54×54 Square Tablecloths, Cotton *Hangs 9 inches off a 3′ Square Table. Color Swatch Pictured: 3rd in from the left. Ivory 54×54 Square Tablecloths, Polyester Blend Total Stock: 54 *Hangs 9 inches off a 3′ Square Table. Color Swatch Pictured: Bottom Row, 7th in from the left. 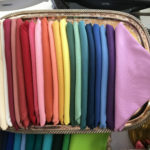 Ivory 62×62 Square Tablecloths, Cotton Unlimited Stock Color Swatch Picture: 3rd in from the left. *Hangs 13 inches off a 3′ Square Table. Ivory 87×87 Square Tablecloths, Cotton Unlimited Stock Color Swatch Picture: 3rd in from left. *Hangs 25 inches off a 3′ Square Table. Kelly Green 120×60 Banquet Tablecloths, Polyester Blend Total Stock: 17 *Mid length on a 6′ Banquet Table. No Color Swatch Picture. A shade darker than Citrus Green. Lavender 120×60 Banquet Tablecloths, Polyester Blend Total Stock: 28 *Mid length on a 6′ Banquet Table. Color Swatch Picture: Top Row, 2nd in from the left.